Repurposing your content is a great idea in general. It’s a way to get your message across in several different forms, with the end goal being to cover the different ways people enjoy taking in information. Some like to read, others like to watch, and still others would rather listen. Converting an article to a slide show and posting on SlideShare is one way of getting it out there for more eyes to see. SlideShare is owned by LinkedIn, so much of the content is business-related. But its topics range from entertainment to food to automotive, and everything in-between. So no matter what your business is, chances are there’s a place on SlideShare for you. And of course you can post your slide show on your own website too. I’m not an expert at this—yet. I created and uploaded my first one only a couple weeks ago. The content is from an article from this website published back in 2014. It’s a tongue-in-cheek look at what NOT to do on your website. 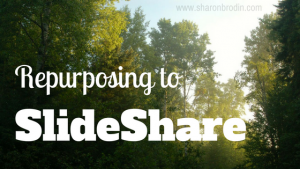 Why repurpose your content to SlideShare? The biggest reason? Presentations using color visuals can gain you 80% more readers. Some of your visitors will like their content in color, with images and in small bits. Visuals get more attention, and can keep attention longer. My SlideShare above doesn’t have graphics included, but most do, and that’s certainly recommended. SlideShare presentations don’t have sound with them. If sound (music or voice-over) is added, then it becomes a video. One advantage of a slide show over a video is the much smaller file size. It loads faster, and can be attached to an email easily. Putting your slide show on SlideShare (with your LinkedIn account) means it’s getting out there to more people—to the tune of 70 million possible viewers a month! Want to take advantage of SlideShare but don’t have the time or expertise yourself? I’d love to help you. I can take existing content and repurpose into a SlideShare for you, or write new material. Let me know today, and we can get started: sharon@sharonbrodin.com. Is Your Website Content Easy to Read?